APsystems will offer installer training at the NABCEP Continuing Education Conference 2019, March 25-28 in San Diego, California. Chris Barrett, APsystems Senior Director of Technical Support, will be conducting training on “Next-gen multi-module microinverters to reduce installation costs.” APsystems has been approved by NABCEP to confer continuing education credits on its training. APsystems is proud to be a Diamond Sponsor and exhibitor at this year’s conference! In addition to valuable training, attendees will have an opportunity to see the latest and greatest products from APsystems and ask questions of our team members. To register for the seminar, installers can log into their NABCEP profile and choose the training session offered by APsystems. See more information about the conference schedule and other exhibition details here. Chris Barrett brings more than 20 years’ experience in the solar and semiconductor industries. He previously held positions with Brooks Automation, Netmercury, Ferrotec, and SolarBridge Technologies. At APsystems, Chris oversees U.S. technical support and training. Chris holds a Bachelor of Science degree in industrial engineering with business management from Keene State University, and an Associate of Science degree in electromechanical drafting and design technology from New Hampshire Technical College. 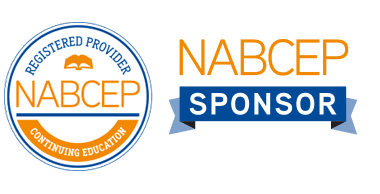 This conference is primarily intended for NABCEP Certified Professionals who need continuing education credits in order to maintain their certification. The content presented in this conference is geared toward seasoned PV industry professionals who have several years of installation and/or technical sales experience. This is the ideal opportunity for NABCEP Certified PV Installation Professionals and PV Technical Sales Professionals to obtain all of the continuing education credits needed for recertification (18 hours every three years). Non-certified professionals can earn up to 18 hours toward certification eligibility. 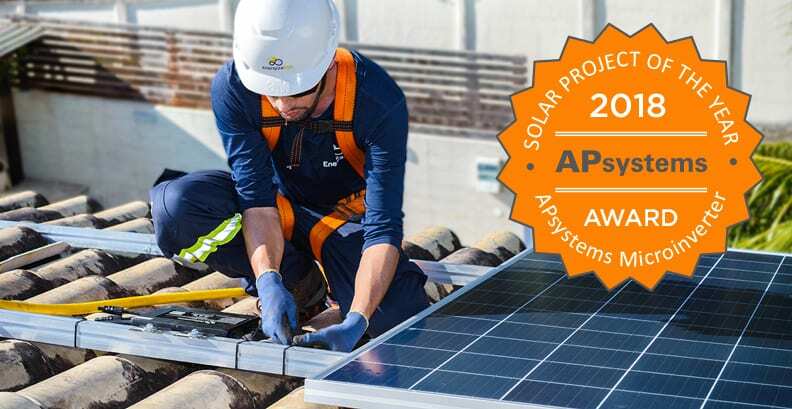 APsystems congratulates installers Swiss Solar Tech Ltd. and Okanagan Solar Ltd., both of British Columbia, Canada, as winners of our annual Project of the Year Awards. 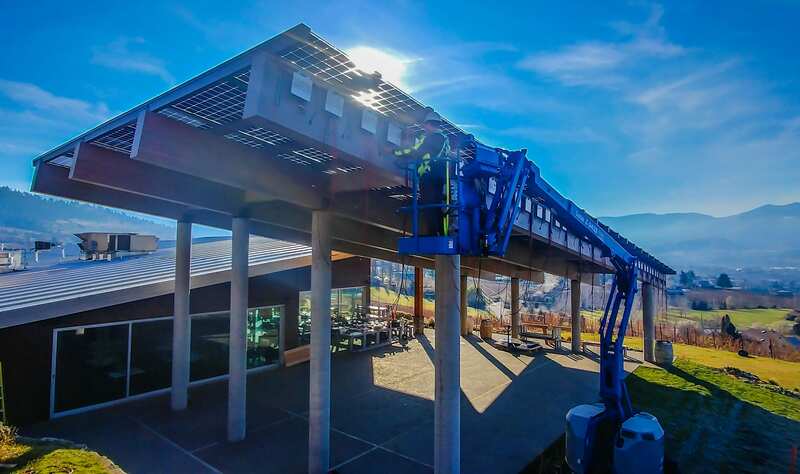 Swiss Solar Tech Ltd. is honored in the Commercial category for the Poplar Grove Winery/Vanilla Pod Restaurant project in BC’s Okanagan Valley. The project creatively showcases APsystems YC1000 true 3-phase microinverters as a visual design element in the 46.36 kW array, creating a solar-shaded outdoor restaurant patio. Okanagan Solar Ltd. is honored in the Residential category for the Carrington View Apartments installation in West Kelowna, BC. The 225 kW project uses APsystems YC1000-3 microinverters to create an ambitious three-building, 240-unit solar-powered complex, demonstrating the vitality and growth of multifamily solar. APsystems thanks all installers and customers who participated in the 2018 Project of the Year Awards contest. Read more about the Swiss Solar Tech commercial installation here. Read more about the Okanagan Sola residential project here. As single-family residential solar booms across North America, multi-family projects are catching on as a vibrant market segment for developers and installers alike. 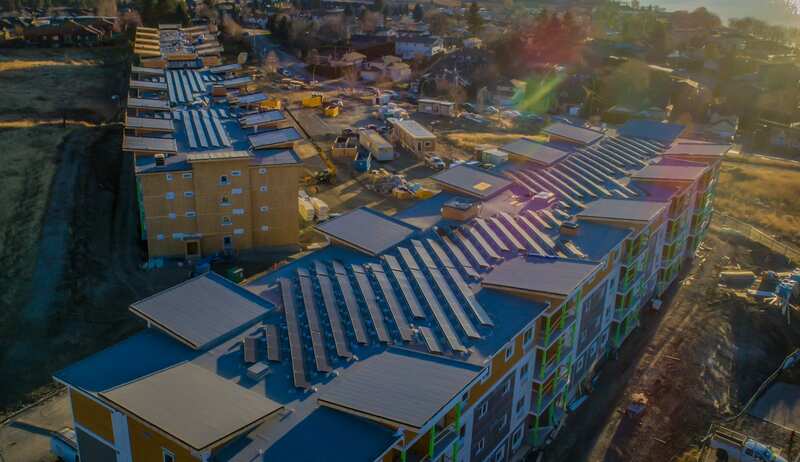 A developer in West Kelowna, British Columbia, is leading the trend, now completing its eighth multi-family residential solar project in just a short time with installer Okanagan Solar Ltd.
Their newest showcase: the Carrington View Apartments, an ambitious three-building, 240-unit solar-powered complex. 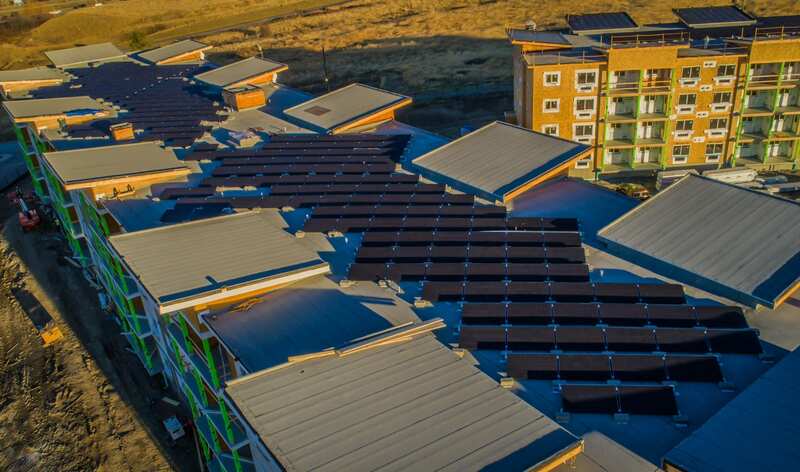 For demonstrating the vitality of multifamily solar, Carrington View by Okanagan Solar, Ltd., earns an APsystems Project of the Year Award in the Residential category. Robert Monteith of Okanagan Solar Ltd. credited “trust and training” received from distributor National Solar and the APsystems technical and sales team for choosing APsystems microinverters for the project. The rooftop arrays use the APsystems YC1000 3-phase units. Before the install, Monteith took APsystems microinverters and related components to the local electrical inspection branch for their review. He also invited them to an install at the nearby St. Hubertus Winery, where code-compliance inspectors tested the rapid-shutdown capability of the APsystems utility-interactive inverters. Inspectors came away suitably impressed with the APsystems safety features, not least the fact that the microinverters went to low-voltage AC right at the solar panel. Notwithstanding its scale, Monteith said the install went without a hitch; technical challenges were resolved ahead of time with good planning and communication with the entire consultant team. The APsystems technical support team made a site visit during planning and offered suggestions to make the install run smoothly. There’s more to come – Okanagan Solar Ltd. will install 1.5mW of solar for this same client in 2019. The builder has embraced renewables, Monteith said, and will soon complete the first net-zero residential building in the province. What is the most rewarding aspect of the Carrington View project? 2018 Commercial Award Winner: Poplar Grove Winery/Vanilla Pod Restaurant, Okanagan, B.C. The same temperate climate and generous sunlight that makes the Okanagan Valley ideal for growing grapes makes it perfect for a natural harvest of another sort: solar. 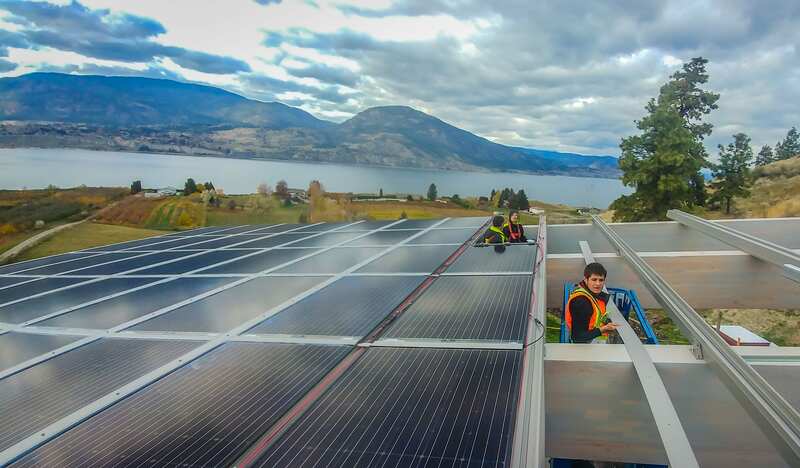 When Tony and Barbara Holler, owners of Poplar Grove Winery, decided to add a solar-covered patio to the winery’s Vanilla Pod Restaurant, they worked with installer Swiss Solar Tech Ltd. for a design that not only optimized harvest, but highlighted the solar technology itself. For showcasing solar in a popular restaurant setting, the Swiss Solar Tech Ltd. is the winner of the APsystems 2018 Project of the Year Award for the Commercial category. Poplar Grove winery and its 100-acre estate vineyards are perched on a mountainside overlooking the picturesque Okanagan Valley Lake and the town of Penticton in British Columbia, Canada. It’s the Hollers’ second winery to go solar using APsystems microinverter products. In 2017, they installed a 389–module array at their nearby Monster Winery. At Poplar Grove, Swiss Solar Tech Ltd. came up with an attractive, innovative design: a solar shaded restaurant patio that would provide enjoyable lunches and dinners for visitors, while harnessing the sun’s energy year round. The bifacial glass modules overhead make brilliant use of the sun by generating up to 35 percent more energy per watt than traditional single-sided modules. APsystems YC1000 3-phase microinverters tie in directly to the low-voltage DC modules, increasing safety for the guests under the patio awning while eliminating the possibility of high-voltage “arc” fires. 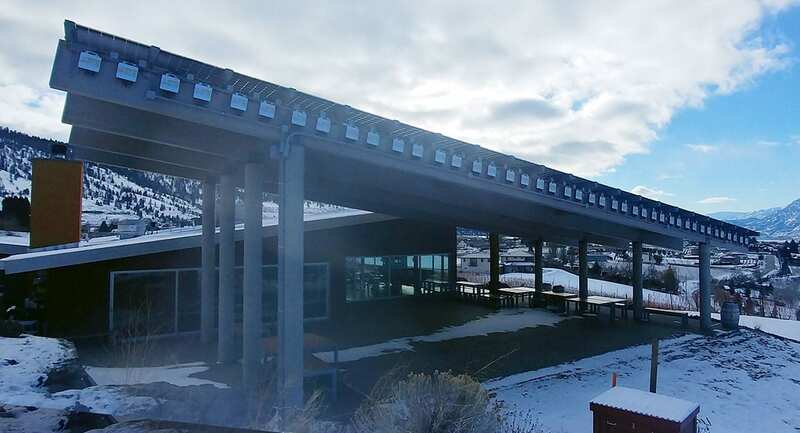 A bold design touch: the APsystems microinverters were left exposed on the patio beam face, in full view of restaurant patrons below. It’s a rare moment in the sun, so to speak, for a solar component generally covered over by modules or otherwise tucked out of site. It’s a practical application, said Susan Huber of Swiss Solar Tech Ltd., as the open installation allows for easy inspection and maintenance, while the YC-1000’s NEMA-6 metal enclosures offer robust protection from the elements. But there was a more important reason: for the Hollers, this project was not just about harnessing solar, but promoting it. Installer: Swiss Solar Tech Ltd.
https://usa.apsystems.com/wp-content/uploads/2019/02/poplargrove5.jpg 2277 3840 APsystems Team https://usa.apsystems.com/wp-content/uploads/2018/05/apsystems-logo-300x92.jpg APsystems Team2019-02-27 22:56:502019-02-27 22:56:502018 Commercial Award Winner: Poplar Grove Winery/Vanilla Pod Restaurant, Okanagan, B.C. A smart grid needs a very smart inverter – and fast data communications. 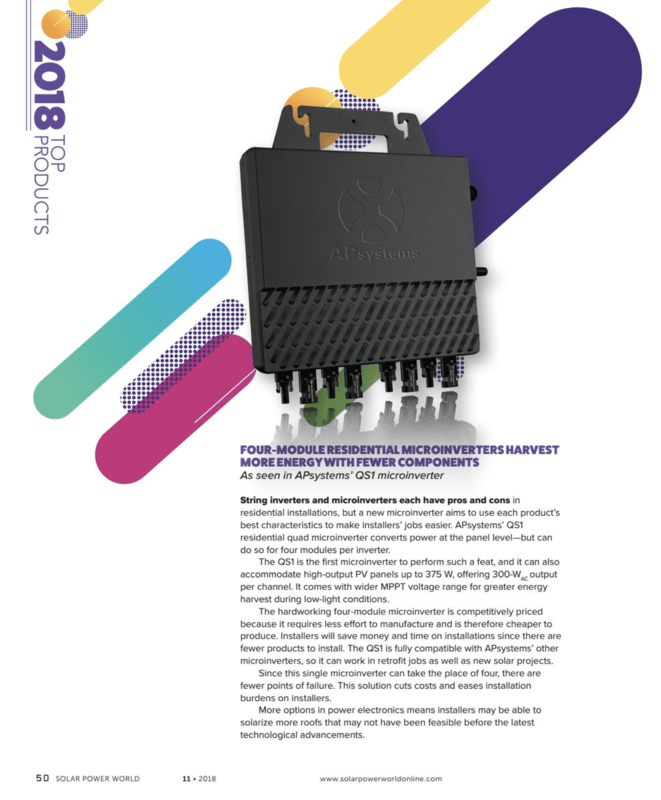 Solar Builder Magazine dives into the high-speed ZigBee communications capability built into the APsystems QS1, the most powerful microinverter on the market. Up to 3x faster than standard PLC, the QS1 ZigBee creates a 2.4GhZ “mesh” network for fast, reliable performance tracking across your array. Get the whole story in Solar Builder here. 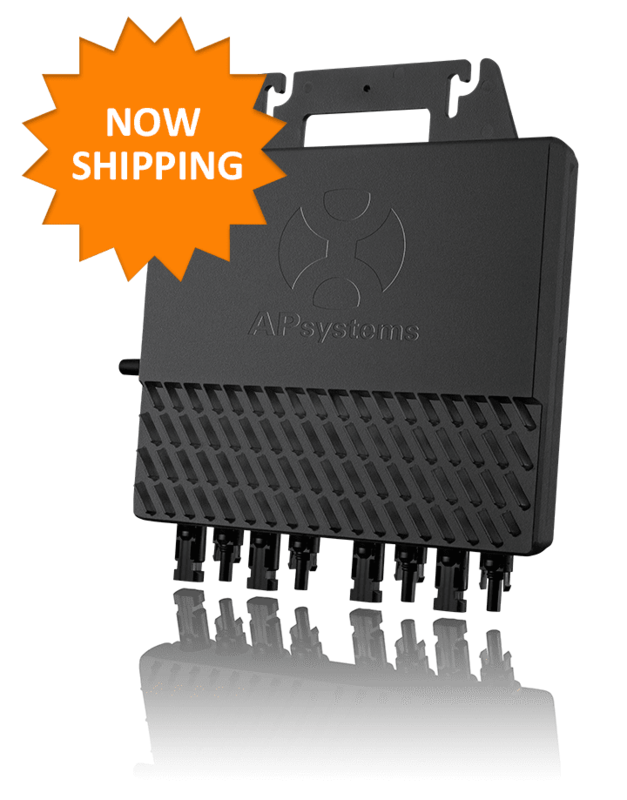 The APsystems QS1, an innovative four-module, single-phase microinverter for residential applications, is now shipping in the USA. A bold step forward in microinverter technology, the QS1 offers 300% faster installation time, while offering the highest peak output power and up to 3X faster data transmission speed than PLC. A wider MPPT voltage range will result in a greater energy harvest for homeowners. The first of its kind, the QS1 is designed to accommodate today’s high output PV panels up to 375W, offering 300W AC output per channel, highest in the microinverter segment. The unit significantly reduces installation time and costs, taking the place of four conventional microinverters per each QS1 installed while providing independent MPPT for each module. The QS1 shares common AC trunk cabling with APsystems’popular dual-module YC600 microinverter, offering flexible mix-and-match compatibility on the same circuit to enhance site design capability and maximize circuit capacity. Both microinverters utilize the same gateways; installers can choose from the ECU-R, for single or multi-residential installations, or the ECU-C, for applications requiring consumption monitoring and advanced contact/relay features. The QS1 builds on the successful APsystems line of multi-module microinverters, simplifying installation while reducing installer costs and time on the job site. Contact your local distributor or sales.usa@APsystems.com to bring the QS1 to your customers today. The first of its kind, the QS1 is designed to accommodate today’s high output PV panels up to 375W, offering 300W AC output per channel, the highest among microinverters. The QS1 offers up to 3X faster data transmission speed than PLC and a wider MPPT voltage range means a greater energy harvest for homeowners. The unit significantly reduces installation time and costs, taking the place of four conventional microinverters per each QS1 installed while providing independent MPPT for each module. The QS1 shares common AC trunk cabling with APsystems’ popular dual-module YC600 microinverter, offering flexible mix-and-match compatibility on the same circuit to enhance site design capability and maximize circuit capacity. The QS1 builds on the successful APsystems line of multi-module microinverters, simplifying installation while reducing installation costs and time on the job site. See the QS1 at booth No. 414. Contact sales.usa@APsystems.com to set up a meeting during the convention, or just come by the booth and meet the APsystems team. Solar Power Northeast is designed to serve and advance the PV solar market, by bringing together PV industry leaders, professionals, manufacturers, and service providers to explore business solutions, new technologies, policy initiatives, and other market factors. Four high-output modules on a single microinverter? Believe it. The new QS1 residential quad microinverter from APsystems earns an Editor’s Pick as one of the top solar products of 2018. Built for large-scale systems and demanding environments, the QS1 handles modules up to 375W, with wider MPPT range for greater solar harvest in low-light conditions. 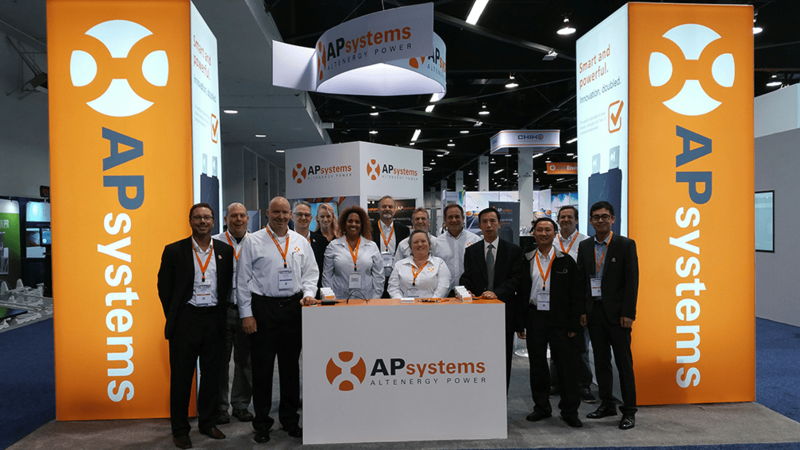 It’s been another great year for APsystems and we have you, our solar partners, to thank for it. You’ve put our advanced microinverter technology to work for customers in markets across the country. Now it’s time once again to look back on the great solar successes of the past year and share your very best stories with the industry and the world. APsystems invites you to nominate your North America projects for the 2018 Solar Project of the Year Awards. Tell us about your very best project – what set it apart in terms of scale, design, power output, challenging conditions, or your creative application of APsystems microinverter technology. We’d like you to submit the project details here, including a brief write-up about your best installation, or more – enter all the projects you like. Remember to include some high-res photographs and any close-ups showing our microinverters in action. Your project can be completed or still in process. Entries will be judged by our APsystems team. We’ll be honoring top North America projects in both Residential and Commercial categories. And we’ll announce the APsystems Solar Project of the Year Award winners early in the new year through announcements and promotions that will highlight your project and your company. APsystems is committed to helping you grow your solar business even as we grow ours, so this is a cross-promotion opportunity you’ll definitely want to take advantage of. The winner in each category will receive $500. Our contest last year generated great interest from installers and brought out some fantastic projects; you can see the winners here. Now we’re excited to present this competition, highlighting the very best APsystems microinverter installations of 2018. Submit your project entries here by January 11th 2019. Please read the terms and conditions before entering. If you have any questions, please contact our marketing coordinator. Thank you for partnership and support, and for a great 2018 for our company and yours. 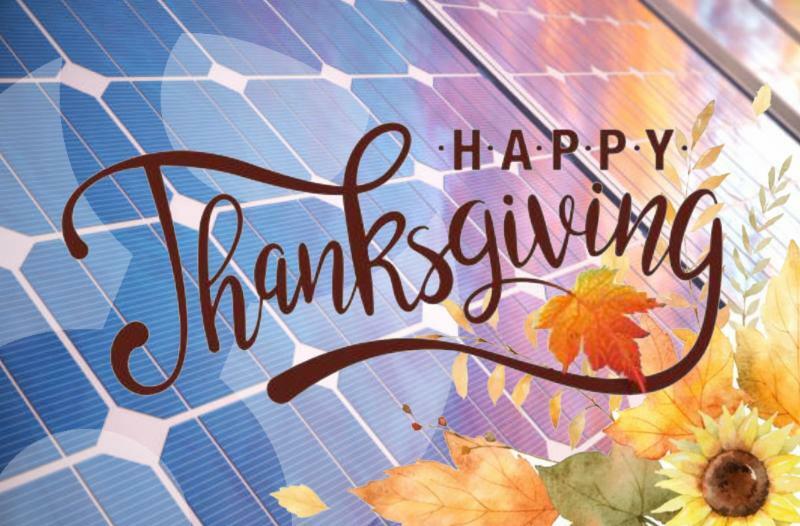 Thanks to all of our solar partners across the U.S.
With the national day of gratitude upon us, the APsystems team would like to extend our sincere thanks to all of our solar partners across the U.S. We have a lot to be thankful for. 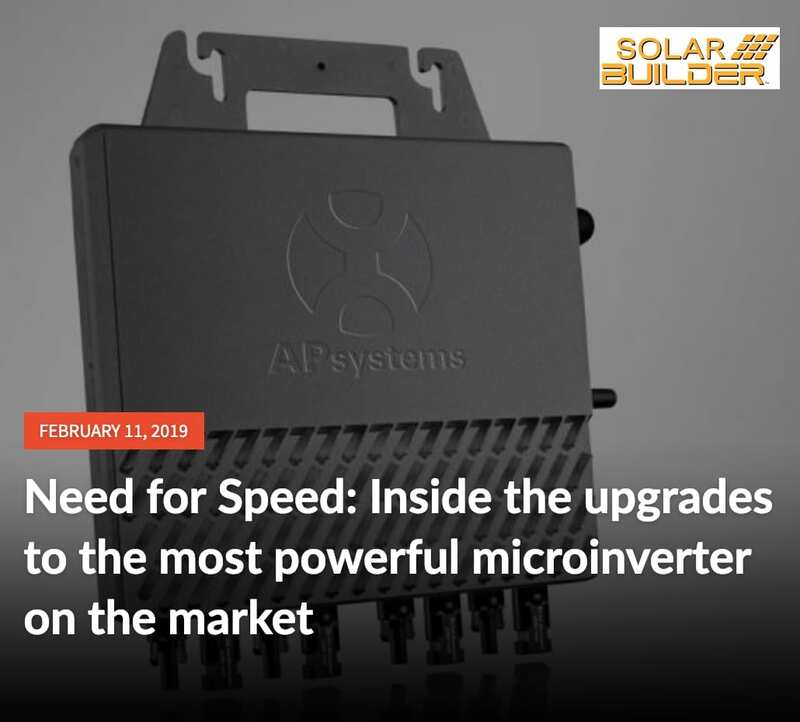 The support and enthusiasm from our partner distributors, installers and end-users alike have helped make APsystems the #2 microinverter provider in the solar industry. We’re here because of you – thank you! Our latest groundbreaking microinverter product will roll out after the New Year, so be watching for details. For now, as we pause to acknowledge the bounties that we enjoy and share, please accept our heartfelt appreciation for your support of APsystems. https://usa.apsystems.com/wp-content/uploads/2018/11/APs-thanksgiving-2017-A.jpg 526 800 APsystems Team https://usa.apsystems.com/wp-content/uploads/2018/05/apsystems-logo-300x92.jpg APsystems Team2018-11-20 18:14:352018-11-20 18:16:17Thanks to all of our solar partners across the U.S.